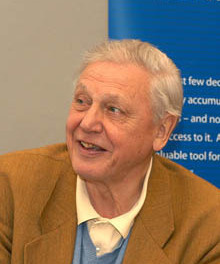 High profile British Climate Advocate David Attenborough, who in 2015 was invited to the Whitehouse by President Obama to advise on climate issues, has come under fire for promoting a discredited “Aquatic Ape” theory. Occasionally in science there are theories that refuse to die despite the overwhelming evidence against them. The “aquatic ape hypothesis” is one of these, now championed by Sir David Attenborough in his recent BBC Radio 4 series The Waterside Ape. ← China Can’t Afford Renewable Subsidies Either! Sir David is 100 % correct. We didn’t run over savannas as ill-informed traditional paleo-anthropologists still anthropocentrically (pre-darwinian) believe, but archaic Homo during the Ice Ages simply followed the African & Eurasian coasts & rivers, they even reached islands far overseas: Flores, Crete, Cyprus, Celebes etc. The collected seafood (very rich in brain-specific nutrients) but also stranded whales & drowned ungulates at the waterside. For serious information, google e.g. “econiche Homo” or (an answer of scientists to just-so unscientific opinion you quote above) “Schagatay Brenna reply”.